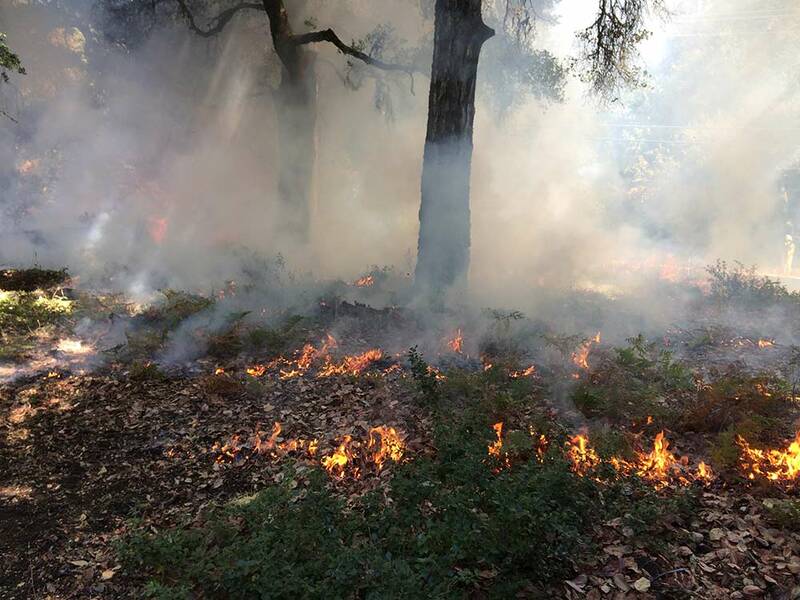 Controlled burns, like this one at San Vicente Redwoods, remove excess fuel from the forest floor and support the health of native plants. Picture this: a crew of 25+ firefighters, 10 representatives from the Amah Mutsun Tribal Council and Land Trust, and 10 or so more people from Sempervirens Fund, POST and a PBS/Nova film team in the San Vicente Redwoods. There we were, nearly 50 people huddled together on the side of Empire Grade Road near Bonny Doon early Monday morning. What brought this motley group together you might ask? And not fire, in the sense of “oh no – wildfire, devastation!” Not at all. This controlled fire was the opposite, this was wanted and started with our own hands. Fire is one of the most natural and restorative processes that happens in nature. Native Californians who lived on this land burned regularly to aid the forest system. And, ecologists have discovered that many plants are fire adapted and only germinate after fire. Most of these plants, including redwoods, can survive fire relatively easily and grow vigorously after competitive trees are burned away. Fire also reveals resources from deep soil layers, which allows a wide range of flowering plants to thrive. A forest that has been managed using controlled fire creates a complex mosaic of plant communities. This complexity is what allowed Native Californians to have a diversity of food and materials to support their livelihoods. 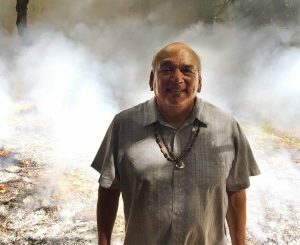 Val Lopez, chairman of the Amah Mutsun Tribal Band, helped oversee the first ceremonial fire on historic Amuh Mutsun tribal land in over 200 years. A renewed the forest ecosystem, along with fuel load reduction, motivated this fire on 5 acres of San Vicente Redwoods. According to Val Lopez, chairman of the Amah Mutsun Tribal Band, this was the first fire on the coast started ceremonially in over 200 years! At the start of the ceremony, Val also described that: In the first year after fire, tender plants regenerate providing forage for four-legged kin. And in the second year after fire, plants emerge that provide material for basket weaving. The effects of this controlled burn on vegetation will be studied by members of the Amah Mutsun Land Trust. They’re evaluating the effectiveness of fire as a tool for vegetation management, enhancement of ethnobotanical plants and fire safety. I’m honored to have been a witness to this burn and see, first hand, the blending of modern fire science with traditional indigenous culture.